This song is believed by many to be a traditional Japanese air. In spite of that, both the author of the lyrics and the composer of the music are known. The lyrics were written by Japanese poet Doï Bansui, while the music was composed for koto (a traditional Japanese stringed instrument) by the pianist and composer Rentarō Taki in 1901. The song was inspired by the ruins of Okajyo Castle built in 1185.
and cups of wine were passed around. Then up from the old pine the moon rose. But now, where is the brightness of bygone days? Taki's original melody was in the key of B minor, and written using mainly eighth notes. 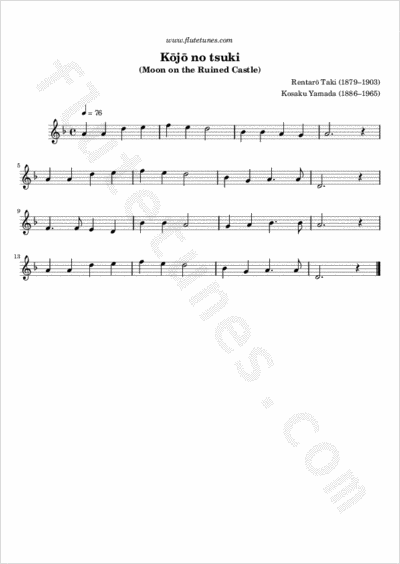 In 1917 Kosaku Yamada, one of the most famous composers in Japan, rewrote the song in D minor using quarter notes, thus making the piece 16 bars long. Yamada also slightly modified the melody, lowering the eleventh note of the tune by a semitone (in D minor, the original eleventh note would have been a G-sharp). A jazz arrangement of “Kōjō no tsuki” was recorded by Thelonious Monk under the title “Japanese Folk Song” on his 1967 album Straight, No Chaser. The song was also sung and recorded live in the form of a power ballad by the German hard rock band Scorpions, during a concert in Tokyo. It was released on their 1978 live album Tokyo Tapes.